As I described last week, I have started making my own medicine, which I thought would lead me to the development of some new fire-building skills. Instead, I have discovered a wonderful new invention – the gas stove. I know, the gas stove is not really a new invention; however, this particular gas stove is. It runs on “bio-gas,” a renewable resource that is readily available here, and everywhere else humans gather: human waste gas. 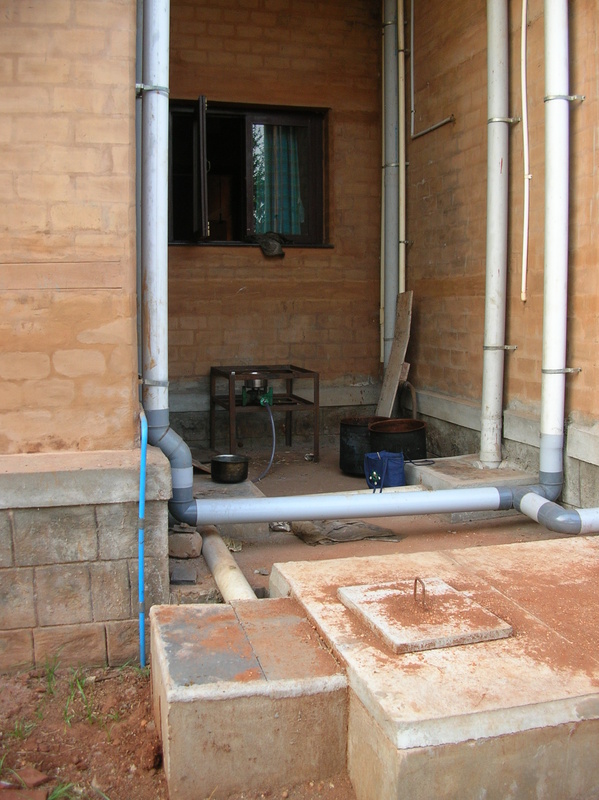 Vaidyagrama is way ahead of the curve in harnessing this source of energy. I don’t understand the mechanics of it in the least, but they have some sort of collection system that treats the waste and simultaneously feeds a gas line to an outdoor stove located behind one of the buildings. 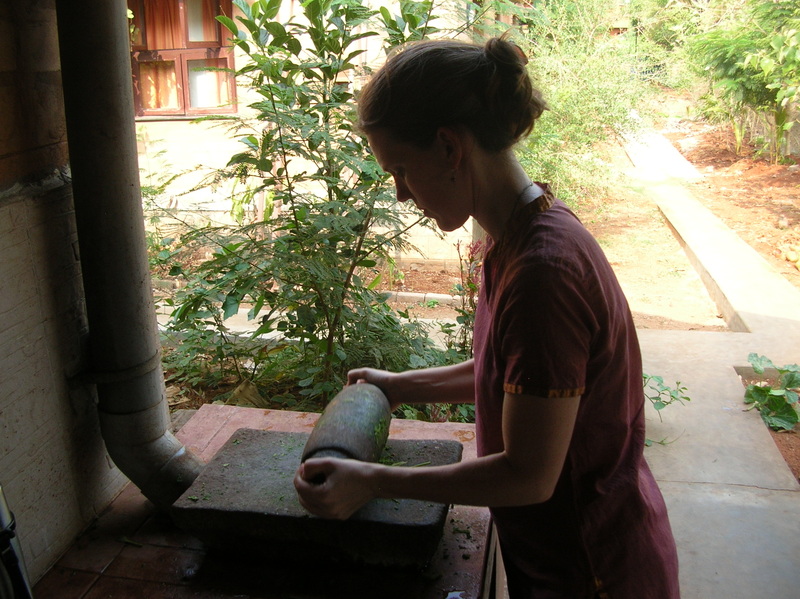 Every day, the staff and guests of Vaidyagrama produce enough natural gas to power this stove for about three to hour hours, entirely free of charge. It’s brilliant. The therapists who do the treatments here are also responsible for preparing the decoctions for the patients. I have an entirely new appreciation for the incredible commitment this is. There are currently about 18 patients here, and each one might have a decoction prescribed daily. Each therapist ends up having to make several decoctions a day. It takes me about an hour every other day to do mine, which has opened my eyes to the incredible medicine-making that has been going on quietly around me the whole time I’ve been here. I am in awe. 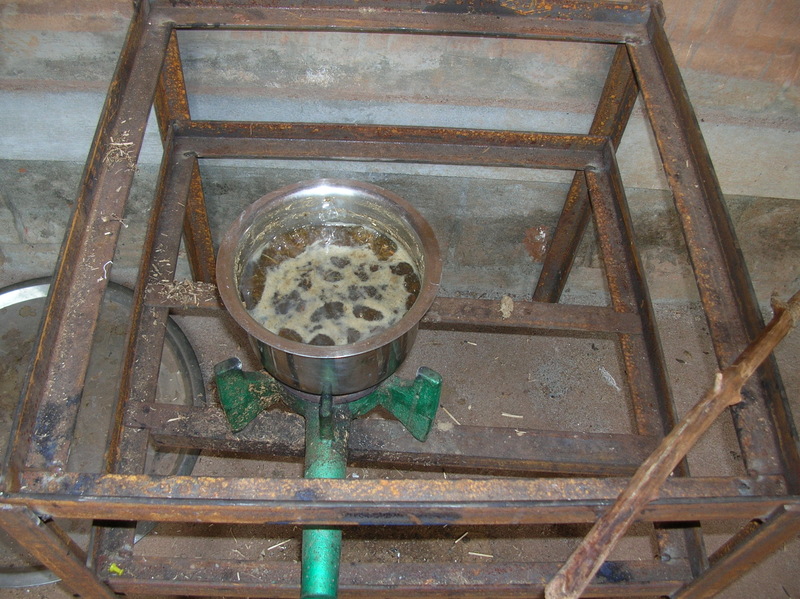 So, as there is no cost to using the bio-gas stove, it is another acceptable option for decoction preparation. Consequently, there can be a bit of a line waiting to use it (that’s how I started to catch on… the therapists were NOT lining up at the fire stove in the kitchen). Once the gas stove is lit and the decoction is cooking away, I have had some time on my hands – about 40 minutes, in fact – for pondering. I’ve found myself doing a lot of thinking about Indian resourcefulness. Placed around the stove are several scrap boards that at first I thought were left over from construction. As the wind whipped around me the other day, I realized they must have been found by someone in the same predicament as me – they make a very effective wind shield. By the same token, there is a certain stick by the stove that I am sure has been used by more than just me to stir my almost-boiling-over decoction. 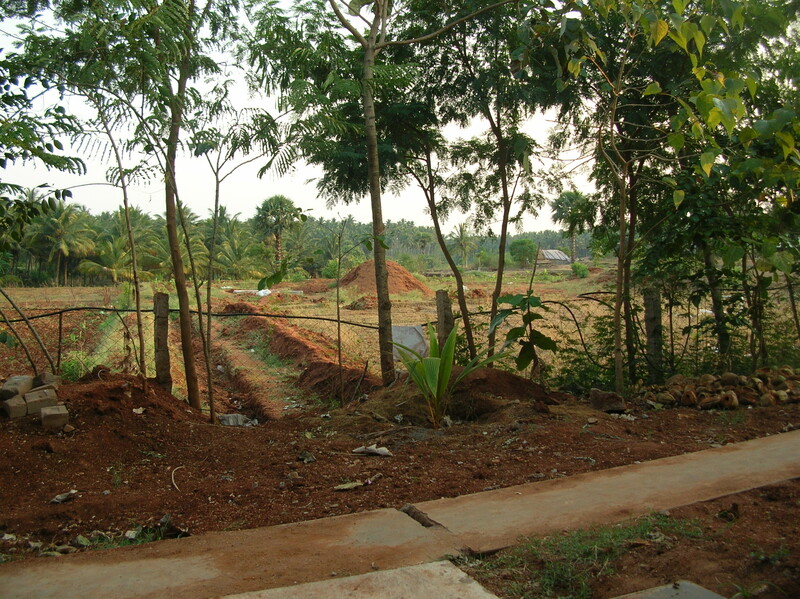 At Vaidyagrama, they are doing an incredible job of finding eco-friendly, renewable resources to support the work done here. While this appeals to the trendy eco-friendly movement that is sweeping Western consciousness, here it has an entirely different feel to it. There is no need to un-train bad habits of wastefulness or to instill a sense of awareness. There is a natural respect for the resources we are using here, because this has been a place of such limited resources. There is no choice but to be ingenious and resourceful here. Last week, my roommate Lynn and I were moved to a new room and it only had one mosquito net, so we asked for another one. When Sundar came to install it, he was empty-handed. No tools, no twine, just his hands and eyes. He looked at the other net, which was held up by a piece of wire wrapped around a horizontal cable, and he proceeded to take down the net, unwrap the wire, bend it repeatedly in the middle until it broke, and then used one half each to put both nets up. Two nights ago, we were eating some sweets that Lynn had brought back from a visit to a temple. They were wrapped in wax paper, and Dr. Om commented, “These papers would work great for making gulikas (herbal tablets), since nothing sticks to them.” There is no sense of deprivation in the ingenuity, rather a sense of creativity and a natural tendency to look for ways to re-use things. While an entire cultural revolution is happening in the west to try to get people to recycle, the better goal would be to stop using so much in the first place. It’s kind of a glass half-empty or half-full thing. Here, it seems everyone is resource-full. There is almost a disdain for that kind of rigging over here, because it means it wasn’t done “right.” I remember seeing a crew of bare footed men in New Delhi repairing a huge underground pipe with a flip flop and some sports tape and realizing that this was the infrastructure. The entire country was held together with that remarkable ingenuity and suddenly the chaos turned to human beauty. that indian resourcefulness is truly inspiring and remarkable. love seeing you living it. May I just say how much I love hearing stories of very-little Ivy and Ian from Aunt Flo?? I am not surprised in the least that even then, Ivy showed herself resourceful. That is one of the things that struck me early on about this woman. No simpering, whimpering, “I can’t” about Ivy! And may I also say how grateful I am that Ivy is to Koruna Muse as Flo is to Ivy? Whoa! I know, I love having Flo as my role model! Oh Honey, may I say how privileged I was to be in their company, then and now? As astonishing as it was to see those two little children coming along, it was even more so for me to observe their parents, Jake and Virginia, teaching and guiding them through the years….they molded those two little people beautifully, and because J&V are the way they are, they will refuse to be recognized, they will say that Ivy and Ian’s innate goodness molded THEM, and not the other way around. I’m just honored to be in this family, as you can tell. I’ve said to both of those kids that they make me want to be a better person and, even though I got mildly chided for saying so, I’m not withdrawing the remark!! Enter your email address here to receive new posts by email. 10 Ways to Pacify Pitta NOW!